Aside from the stunning landscape, one thing that is great about Boracay Suites is its accessibility. 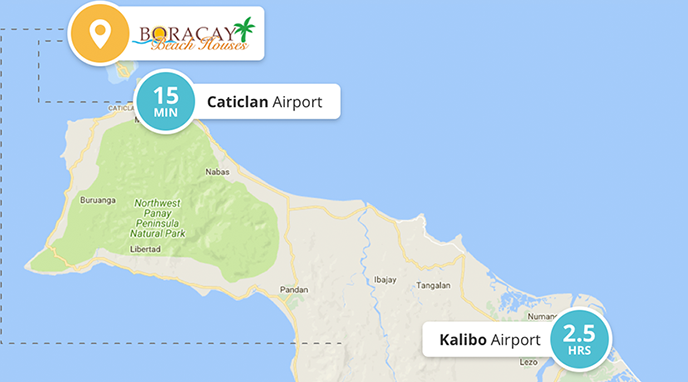 There are two airports serving Boracay-bound passengers: either you fly in Kalibo International Airport or Caticlan Airport. Ticket prices to Kalibo are much cheaper than to Caticlan. Choosing between Kalibo and Caticlan is easy. The question you need to ask yourself is: Do you have more money or more time? If the former, then go ahead, make your life easier, and book straight to Caticlan. But for many of us who have a lot of time but always not enough money, Kalibo makes more sense. • Station 1 near the northern end, which has several high-end resorts. • Station 2, the most vibrant and where ‘D Mall, ‘D Talipapa (Little Market), and most bars, shops, and entertainment spots are located. • Station 3, relatively secluded but still within walking distance of everything and with its own share of exclusive resorts and bars. This is where Boracay Beach Houses is found. Bulabog Beach This is situated at the other side of island, facing eastward. The sports and adventure capital of the island, it has reef-protected waters perfect for windsurfing and kiteboarding. Diniwid Beach A rather secluded area north of White Beach, it is connected to the main beach through a foot path around the headland. Puka Beach Located on the north tip, this part of the island free from commercial establishments. Puka Beach Located on the north tip, this part of the island free from commercial establishments. It is here, too, that locals gather the small lovely shells sold as jewelry. You can have a lovely picnic here. Boracay beach, accommodations, and vacation rentals are generally at their best whenever you wish to come. The island, however, marks peak season at these times of the year: Christmas and New Year, Holy Week (usually late March or April), and Chinese New Year (February). Heavy tourism, too, can be expected during the Philippine summer season (March to May).